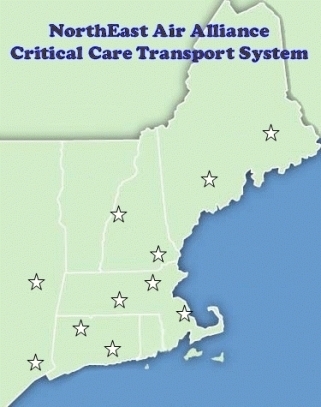 NEAA, the North East Air Alliance, was founded by Boston MedFlight, UMass LifeFlight and Hartford LIFE STAR air medical programs in 1989-1990, as a joint venture to facilitate information exchange. Original members included: Terry Dougherty and Suzanne K. Wedel from Boston MedFlight; Lenworth Jacobs, Sherry Stohler and Sid Wainman from Hartford LIFE STAR; and Ken Williams and Lura Donnelly from UMass LifeFlight. Originally called the New England Air Alliance, the name was changed several years ago with the addition of three air medical programs to the group. These are LifeFlight of Maine, Dartmouth-Hitchcock/(DHART) and Albany Med Flight - LifeNet of New York. The mission of NEAA is to share information, discuss experiences, and encourage communications among the programs in order to maintain a safe and high quality critical care transport system in the region. © NEAA 2009 - 2012 all rights reserved.